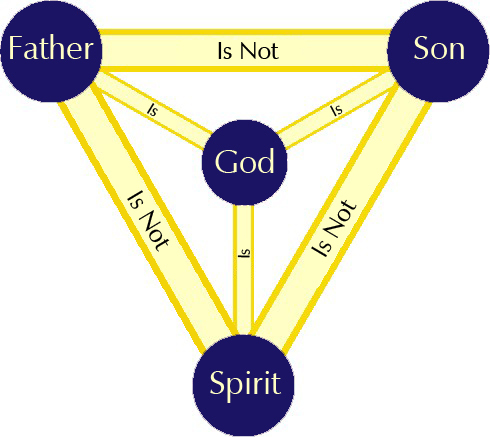 Basic Christian doctrine teaches that God is Triune. As foundational as the doctrine of the Trinity is to Christianity, the teaching is difficult to understand. The Trinity seems to be paradoxical and impossible. The doctrine of the Trinity can be summed up with the statement, “God is One God who is Three.” This doctrine does not teach God is three Gods, that God is one God with three different manifestations of His personality, nor that the three persons of the Trinity are each one third God. The doctrine of Trinity is that God is One God who consists of three persons. Each person of the Trinue Godhead is fully equal with the others and each possesses the full attributes of God. All three persons of the Trinity are eternal, all powerful, all wise, all knowing, holy, loving and perfect. Each person of the Trinity is fully God. Each is different and distinct from the other. The Father is not the Son and the Son is not the Holy Spirit. Each is different and distinct but they cannot be divided from the other. The Father, Son and Spirit do not exist separately from one another. The starting point of the Trinity is the singleness of God. The Father, Son and Spirit are each declared to be fully God. The deity of each member of the Trinity is explictly declared in Scriptures (John 1:1; Acts 5:3-4; 1 Corinthians 8:6). It is implicitly declared in the work and nature of God such as creation, sovereignty, omnipotence and eternality. The distinction in the Godhead becomes evident in God’s dealing with man. God the Father administrates the plan of salvation and hears and answers prayers. The Son is the redeemer of man who became man. Through the death of Jesus, God the Son, man can be forgiven. The Son is the head of the church who intercedes for believers. The Son is Mediator between God and man. The Spirit applies salvation to the heart of men, convicting of sin and regenerating those who believe. The Holy Spirit is sent from the Father by the Son to indwell the believer. The Holy Spirit enables Christians to serve in the church. Each member of the Trinity exercises a different and distinct function in relation to man. The doctrine of the Trinity is a fundamental doctrine discovered by a comparison of the Bible’s teachings. This doctrine is not a new development. This doctrine is not a New Testament development. This great doctrine does not rest upon a single verse which declares and defines the Trinity. The doctrine of the Trinity rests upon the comprehensive statements about God found throughout the Bible. It is built on statements like Deuteronomy 6:4 which proclaim a single God, “Here O Israel, the Lord our Lord is one Lord.” When the statements of the singleness and unity of God is compared to werses such as Matthew 28:19, 1 Peter 1:2 and 2 Corinthians 13:14 the Triune nature of God begins to be realized. The Bible declares God to be comprised of Father, Son and Spirit. Each of these is revealed as unique from the others. Each is taught as possessing all the attributes of God. Though the doctrine of the Trinity is not explicitly taught in one place in the Bible, it is nevertheless a doctrine unmistakably revealed throughout Bible. The basic principles of the Trinity are found as early as Genesis 1. Though the Trinity is a difficult doctrine to understand which will never fully be explained by men, it is a Biblical truth that must be believed by all those who profess to believe God’s Word.